We’re really getting into desserts these days. I think we might have made two in the one month! We’re not really dessert people but lots of are friends are so we’ve been making an effort. This is a Spanish cake which is flavoured with orange and almond and is traditionally marked with the shape of a cross on the top. You don’t have to serve it with the strawberries but they work really well. Mix the strawberries in a bowl with the sugar and vinegar, cover and leave to marinade in the fridge for about 2 hours. Heat the oven to 160C/140C fan/gas 3. Butter and line a 22cm springform tin with baking parchment. Use an electric whisk to mix the eggs and sugar until pale and thick. Gently fold in the almonds and zest with a metal spoon. Pour the mixture into the tin and bake for 50 minutes – it should be golden and a skewer pushed into the centre of the cake should come away clean. Take the cake out of the oven and cover with a clean tea towel to cool it down, so it doesn’t dry out. Dust with icing sugar and serve with the strawberries and ice cream. Wine Suggestion: Try a rich Olorosso, a dark sherry from Spain, which has a warm nuttiness to complement the almond flavour in the cake. Love the idea of the sherry with the almond cake. Delicious. 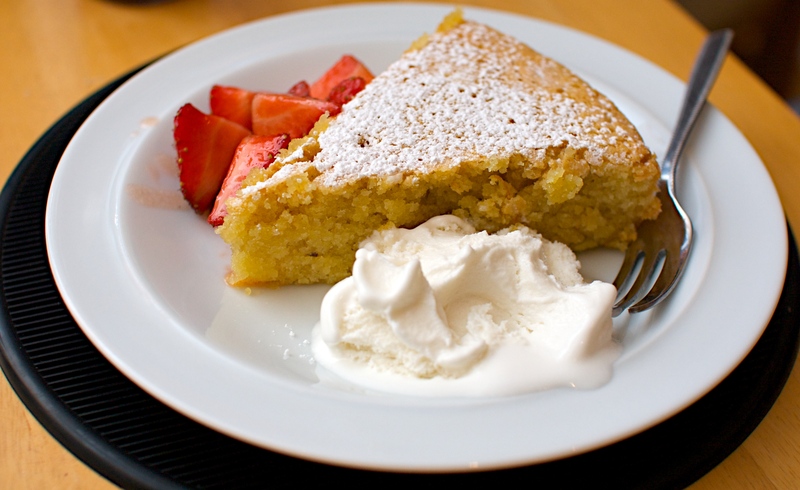 The sherry vinegar strawberries, ice cream and almond cake-what a wonderful combination!! Thanks Nurul, we liked the textures and contrasts of flavours and temperatures in this dish.